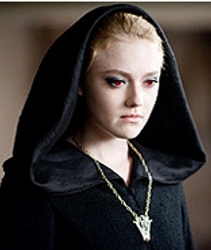 As reported on Entertainment Tonight (ET) Bubbly blonde star Dakota Fanning is apparently loving going to high school. As has been previously reported, Dakota was home schooled during the early days of her life but moved to public high school for her freshman year. She tried out for the cheerleading team and won a position at Campbell Hall High School. Dakota has put her Hollywood career on the back burner as she enjoys being a teen-ager. Although she took time out to take on a role in “The Twilight Saga: New Moon”, Dakota is back at high school where she was recently inducted into the Homecoming Court at her high school’s football game on Friday night (October 30, 2009). During the game, Dakota cheered for her high school’s team as part of the cheerleading squad. She was a flyer during the squad’s stunts and nailed all her splits with ease. The 15 year old actress was thrilled to be inducted into the Homecoming Court. She was given a sash, crown and a gorgeous bouquet of red roses. The dark role was a big career change for Dakota who normally plays sweet characters. Jane is very bad news, definitely not the typical character Dakota has portrayed in the past. Dakota joked with the media about the white face powder she wore for the flick. “I thought I was pale before I did the movie, but I realized that I’m not!” Dakota said. This entry was posted on Saturday, October 31st, 2009 at 10:39 pm	and is filed under Celebrity Bites, Celebrity Hairstyles, Celebrity News, Hair, Movies & Films, News. You can follow any responses to this entry through the RSS 2.0 feed. Both comments and pings are currently closed.